Forestry Minister Zulkifli Hasan said he suspected the lion was deliberately killed, saying that it was impossible for the lion to have died in such a way, accidentally. "We want the perpetrator arrested. The death of the lion seems to have been caused intentionally," he said as quoted by Antara news agency on Thursday. 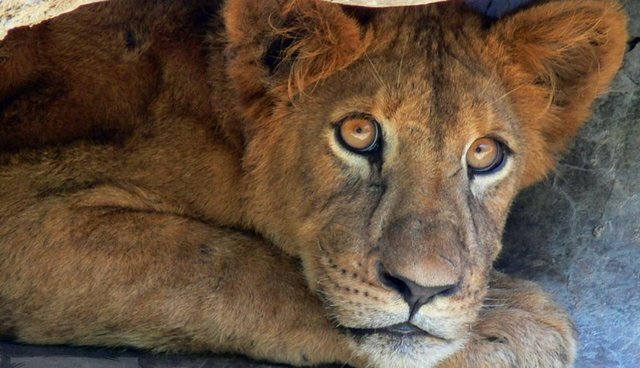 The minister's words should be taken with caution -- Rosek Nursahid, chairman of animal conservation organization ProFauna Indonesia, blamed bad management at the zoo for the lion's death. "This is a reflection of the poor standards of the zoo's management," he said. He also mentioned that his organization had sent reports and recommendations on the need for improvements in Surabaya Zoo since 2000, which were ignored. Last year, the Surabaya Zoo was responsible for 43 animal deaths in a three month period, earning the park the well-deserved nickname "world's cruelest zoo." A petition to close down the Surabaya Zoo on Change.org has gained over 162,000 signatures. *Note: Photo is being used as illustration, not to depict a specific lion.